Shaolin Monastery or Shaolin Temple is a Chán Buddhist temple at Mount Songshan in Henan Province, China. Founded in the 5th century, the monastery is long famous for its association with Chinese martial arts, particularly with Shaolin Kung Fu, and it is the Mahayana Buddhist monastery perhaps best known to the Western world. The oldest evidence of Shaolin participation in combat is a stele from 728 that attests to two occasions: a defense of the monastery from bandits around 610 and their role in a defeat in 621. In this defeat, Kungfu monks saved and allied with Li Shimin, who later became the second Emperor of Tang Dynasty (618-907). Thereafter Shaolin enjoyed the royal patronage of the Tang. From the 8th to the 15th centuries, no extant source documents Shaolin participation in combat; then the 16th and 17th centuries see at least forty extant sources attest that, not only did monks of Shaolin practice martial arts, but martial practice had become such an integral element of Shaolin monastic life that the monks felt the need to justify it by creating new Buddhist lore. References to Shaolin martial arts appear in various literary genres of the late Ming (1368-1644): the epitaphs of Shaolin warrior monks, martial-arts manuals, military encyclopedias, historical writings, travelogues, fiction, and even poetry. In addition, in the long-history development of Shaolin Kung Fu, masters at Shaolin Temple also taught Kungfu to non-Buddhist followers to allow commoners the chance to practice Shaolin Kungfu. This allowed Shaolin Temple to develop several branches in other regions. Some lineages of Karate have oral traditions that claim Shaolin origins. Martial arts traditions in Japan and Korea, and Southeast Asia cite Chinese influence as transmitted by Buddhist monks. Recent developments in the 20th century such as Shorinji Kempo still maintain close ties with China’s Songshan mountain Shaolin Temple due to historic links. Shaolin, in popular culture, has taken on a second life. Since the 1970s, it has been featured in many films, TV shows, video games, cartoons, and other media. While some of these are clear commercial exploitation of the Shaolin Temple and its legends, they have helped make Shaolin a household name around the world, and kept the temple alive in the minds of many young generations, and from vanishing into obscurity like many other ancient traditions. To date, no other temple in the world has achieved such wide spread recognition. Aileen & Norman co-founded Interact China in 2004 with specialization in fine Oriental Aesthetic products handmade by ethnic minorities & Han Chinese. 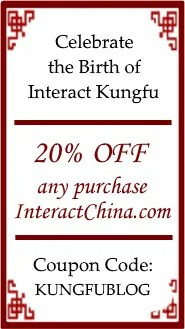 Having direct partnerships with artisans, designers, craft masters and tailors, along with 12 years of solid experience in e-commerce via InteractChina.com, we are well positioned to bridge talented artisans in the East with the rest of the world, and directly bring you finely selected products that are of good quality and aesthetic taste. So far we carry 3000+ goods covering Ladies Fashion, Tailor Shop, Home Furnishings, Babies & Kids, Painting Arts, Textile Arts, Carving Arts, Tribal Jewelry Art, Wall Masks and Musical Instruments. Our team speak English, French, German, Spanish and Italian, and serve customers worldwide with passion and hearts. If you have passion to write about Oriental Aesthetic in Fashion, Home Decor, Art & Crafts, Culture, Music, Books, and Charity, please contact us at bloggers@interactchina.com, we would love to hear from you! July 19, 2017 in Culture & Lifestyle, Culture & Lifestyle.